In North India radish pods are known as moongre. They are sold in bundles and are crunchy. The pods can be eaten raw or cooked. 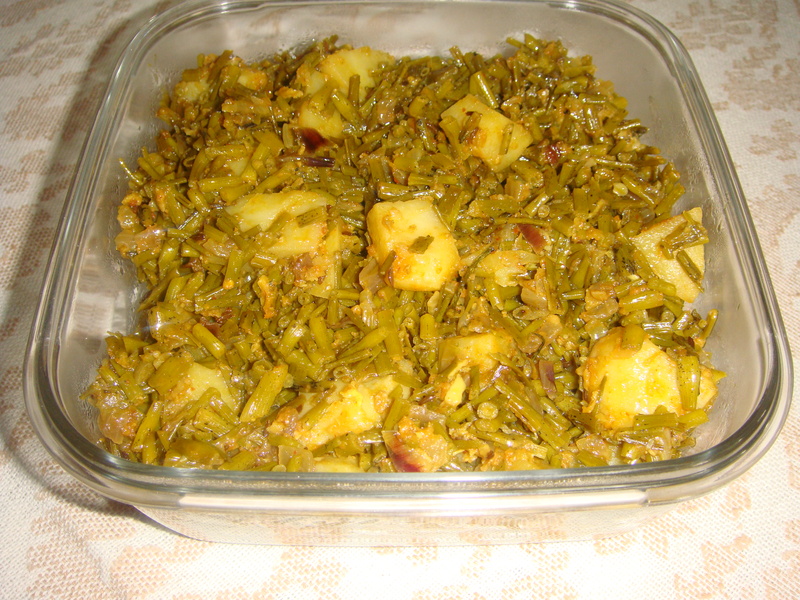 If you love sharp flavours you will like this sabzi. We used to make a chutney by grinding the pods with green chilies and mixing in salt and thick yoghurt. We can make salads also with Radish pods. Radish pods are crunchy and full of flavor. Podding radishes (Raphanus caudatus) are like other radishes in that they need cool weather for top flavor and very cool soil (as soon as it can be worked) for best growth. But, podding radishes tolerate heat better than root radishes when temperatures soar. Radish pods begin to form in 40 to 50 days, lower ones ripening first. 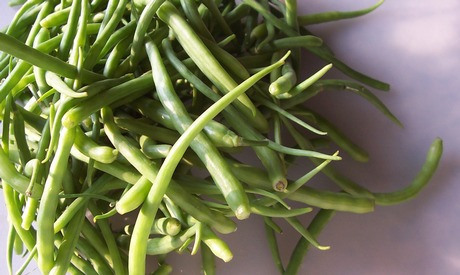 Pick the teardrop-shaped pods when they are tender, before they become fibrous. The 4- to-12-inch long pods are most crisp and flavorful when about pencil-thick.Pod colors range from green to green mottled with lavender to purple. The purple ones are the spiciest. Wash the Moongre / Radish pods. Remove top and bottom ends of each pod. Cut into 1″ long pieces and keep aside. Wash, peel and cube the potatoes and keep aside. Take a heavy bottom pan / wok / or kadahi heat the oil add the cumin seeds . When cumin seed start crackling add asafetida / heeng, fry till it is light pink in colour. Add onions and sauté till light golden in colour, add garlic and ginger and fry for one or two minutes more. Add the pureed tomatoes, salt, turmeric, chili and coriander powder. Stir and cook till the tomatoes are well cooked and the oil begins to surface. Add the cut Moongre / Radish pods and potato cubes. Cover and cook on low flame stirring at regular intervals till potatoes are tender, about 15 to 20 minutes. Serve with any Indian bread of your choice and lentil / dal, Raitas of your choice. The pods are crunchy additions to that first spring salad and fast-to-grow pickle material. Packed with Vitamin C, podding radishes also offer plenty of other low-cal, high-fiber nutrients.